Dieter Appelt, Untitled (Erinnerungsspur / Memory's Trace), 1979. 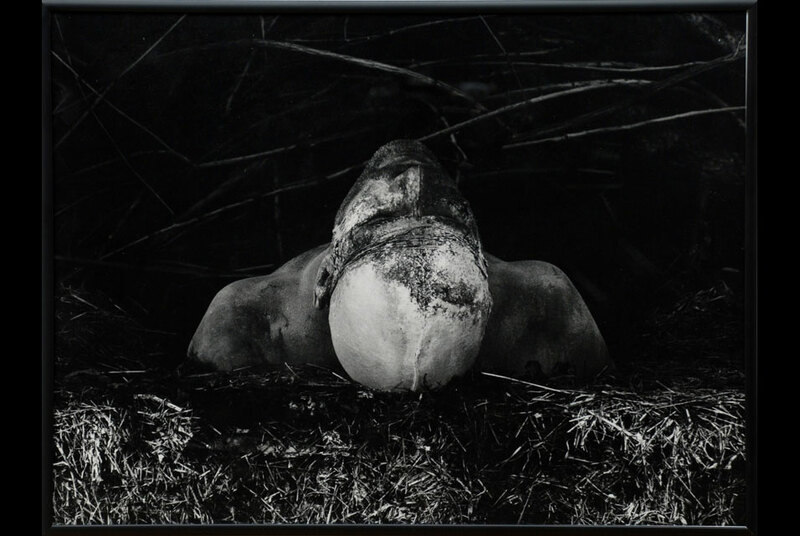 Gelatin silver print, no. 11/25; 15-3/4 x 12 in. Courtesy Priska C. Juschka Fine Art. DENVER, CO.- The Denver Art Museum (DAM) takes a closer look at the medium of clay in its summer exhibition Marvelous Mud: Clay Around the World. Celebrating the prolific and diverse material, Marvelous Mud reveals how clay has shaped culture, creativity, science and industry over time and around the globe. The museumwide exhibition explores one major medium and illustrates its diversity and history through fascinating stories that span time and geographic location. Marvelous Mud is on view June 11 through September 18, 2011, and offers a different way for visitors to experience the DAMs programs and collections. Marvelous Mud features eight exhibitions throughout the Hamilton and North buildings, hands-on and live programming with artists and experts and indoor and outdoor creation stations that allows visitors to discover the medium. The exhibition kicks off with a weekend of celebration. Saturday and Sunday will feature lively onsite activities. Ceramic artist Bob Smith will perform a demonstration of raku firing on the plaza. This visual pyrotechnic firing process takes pots from the kiln at maximum temperatures. The pots are then put into containers of sawdust that produce a thick black smoke that adds to the finish of the vessel. Families can also explore the Mud Studio hands-on activity area and participate in artmaking projects at new in-gallery Hotspots. Marvelous Mud features two large-scale exhibitions in the Hamilton Building galleriesMarajó: Ancient Ceramics from the Mouth of the Amazon and Overthrown: Clay Without Limits. Six additional exhibits are presented in the museums permanent collection galleries. Each display focuses on a particular art form, showing how clay has connected artists for centuries. Marajó: Ancient Ceramics from the Mouth of the Amazon, located in the Martin and McCormick Gallery on level two of the Hamilton Building, focuses on the elaborately decorated red, white and black earthenware ceramics from the people who occupied the Brazilian island of Marajó from A.D. 400 to 1300. Much of the island is flooded each year by rising river waters, so its inhabitants built large artificial mounds to support dwellings, ceremonial spaces and cemeteries. Adorned in an ornate style with modeled, carved and painted human faces and figures, reptiles, snakes and birds, Marajó ceramics were used for feasting, ceremonial life and funerary offerings. Despite their artistic sophistication, ancient Amazonian ceramics are largely unknown to the public. Marajó is the first exhibition devoted to this topic in the United States. Curated by Margaret Young-Sánchez. Overthrown: Clay Without Limits, located primarily in the Anschutz Gallery on level two of the Hamilton Building, brings together regional, national and international artists who push the boundaries of clay to create large-scale installations that respond to the dynamic architecture of the Daniel Libeskind-designed Hamilton Building. The majority of the 25 participating artists will create site-specific artworks. Highlights include a large-scale ceramic and found object sculpture by Linda Sormin that utilizes the colossal slanted wall in the Hamilton Building atrium; an installation of clay flakes, each around 300 pounds, by Neil Forrest; a 23-foot chandelier by Jeanne Quinn; and a tiled enclosure with freestanding elements by Anders Ruhwald. Overthrown also includes a sampling of smaller ceramic objects that acknowledges that other means, besides size, can challenge expectations of the material. Curated by Gwen Chanzit. Blue and White: A Ceramic Journey, located in the William Sharpless Jackson Jr. Gallery on level five of the North Building, conveys the popularity of blue-and-white pottery throughout the centuries in different parts of the world. The technique of creating blue-and-white ceramics was a great innovation of Chinese ceramic history and they became a vital component of Chinas export trade. The exhibit will feature objects from early periods of blue-and-white ceramic production to present day examples. Sternfield, this exhibition aims to both examine these differences and draw connections between the varied uses of these materials in contemporary photography. that responded to the sublime energy of heat, fire and the great mysteries of space. Curated by Gwen Chanzit. Mud to Masterpiece: Mexican Colonial Ceramics, located on level four of the North Building, explores the era of global trade and its effect on traditional Mexican earthenware, Chinese porcelain and Mexican majolica. Between 1521 and 1821, the ancient Mexican ceramic art of unglazed, low-fired earthenware was exported to Spain where it became quite fashionable. In return, Spanish artists introduced the potters wheel and high-fired hard glazes to Mexico, producing a pottery known as majolica. Trade brought Chinese porcelain to Mexico and its decorative motifs influenced both native earthenware and Mexican majolica. More than 30 pieces of Chinese porcelain, Mexican earthenware and Mexican majolica will be exhibited alongside Mexican colonial paintings that depict the use of ceramics in daily life. Curated by Donna Pierce. Potters of Precision: The Coors Porcelain Company, located on level two of the North Building, displays porcelain labware produced by the Golden, Colo., company. The Coors Porcelain Company, now known as CoorsTek, creates specialized scientific formscrucibles, beakers, evaporating dishesthat have remained virtually unchanged since their earliest iteration. Beauty and function exist simultaneously in vessels that serve scientists precisely stated needs. Curated by Darrin Alfred. Nampeyo: Excellence by Name, located in the American Indian Art Galleries on level three of the North Building, spotlights the first American Indian woman to gain personal recognition for her pottery. Recognized as one of the greatest ceramists of the 20th century, this exhibition traces the full spectrum of the famed Hopi artists career, highlighting key elements of her innovative forms and designs and the work of successive generations of her family. Curated by Nancy Blomberg. The museum campus will also become a place for creativity and exploration. When visitors enter the museum, they will instantly spot the Mud Studio, an active workshop for visitors to engage with all things clay on level one of the Hamilton Building. The space will include areas for visitors to see and participate in the clay creative process. Guests can create their own clay masterpiece, choosing to take them home or leave them for display. The studio will host demonstrations on the weekends, and at all times will be a place for building in clay through guided and independent activities and exploring the mess and delight of a ceramicists studio. Visitors who prefer a cleaner experience can watch videos, browse clay and glaze samples and discover other interesting introductory tidbits about ceramics. Kids can check out a nook featuring clay animation. Discovering Paris and the Language of Love in Woody Allen's Movie "Midnight in Paris"